oh how i loved this dish!!! I made something like this about a month ago and it was oh so yummy. 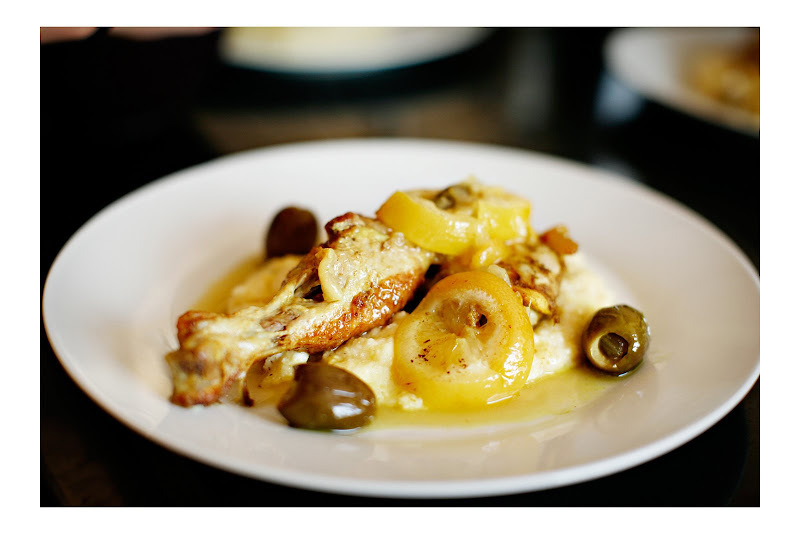 This reminds me a bit of a lemony chicken with raisins recipe I found from Venice. Adding the briney olives will add another dimension. I can't wait. As alaways delectible. The little tagine dishes are adorable! I only have the large clay one I brought with me and I love that it is always a conversation/ice breaker when people come for dinner. The halibut post made me happy but this...this transports me back to many a good dinners with my family. Thank you! Oh geez.. I'm drooling on the keyboard. I am so making this tonight! pve- let us know how it works out ! & tartlette - so happy to be bringing back fond memories, thank you for sharing. thanks for the wonderful comments to all ! Made last night (a Sunday supper) for family guests, and they raved and raved. Extra special b/c I hardly ever cook - little is expected of me (I am known for ordering in) and even my cousin "the foodie" was blown away. Was really easy and so tasty. Thanks much! I really love recipes with chicken! Great recipe. I'm going to try this at home. My family would love this. Yum! This looks tempting! Made me hungry! The taste of the lemon and the chicken mixes into a very amazing flavour!